Does a physical medium simply contain (or mediate) a work of art, or can the medium be a work all its own? Since at least the 1960s and the birth of Conceptualism, artists have produced works that go beyond merely formal concerns to explore the relationship between materiality and process. Robert Morris’s Box with the Sound of Its Own Making (1961) consists of a simple wooden box and the audio of the creation of the box. Is the work a documentation of a performance – the making of the box – or does this very question complicate the notion of documentation as an integral part of the final work itself? Gordon Matta-Clark would take an undeveloped Polaroid covered in gold leaf and fry it (Photo-Fry, 1969), blending consumer instant gratification with a high-status material to produce Christmas cards for friends. Later, Tony Conrad would make films in subversive and often funny ways by evoking relevant processes in ways that pushed the definition of film to its limit. For instance, he sidestepped the use of film altogether for the yellowing over many years of a painted screen in Yellow Movies (1973), making films without film or projectors and on such a timescale that makes Warhol’s Empire seem a reasonable length. Other projects negated the intended use-value of film as a medium, by pickling film and displaying it in a jar (Pickled Film, 1974), or bowing film stretched from floor to head while seated in front of a flickering projector (Bowed Film, 1974). All of these examples foreground the process of transformation in ways that are inseparable from the works themselves, using media in ways other than their intended purpose. Giovanni Lami raises similar questions with Bias, an audio document of “etudes for buried and exhumed audio tape” subtly manipulated into compositions. Rather than record an environment through use of a conventional apparatus, i.e. a microphone, Lami’s tapes make audible the chemical composition of the soil they were buried in, reacting directly with the medium of magnetic tape, akin to a photographer capturing light on film without a camera. Of course, there are many examples of musicians working with buried or otherwise damaged tapes. Dakim’s 34 Fragments (Senufo) immediately comes to mind, in which the producer subjected recordings made on public transportation to all manner of elemental abuse. A recent release from Ian Hawgood and Tim Martin entitled Ouvala draws its raw material from severely damaged and decayed reel-to-reel tapes. Perhaps most famously William Basinski’s Disintegration Loops consists of the real-time degradation of decades old loops of classical instrumentation. The list could go on indefinitely. 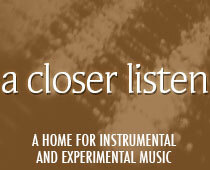 Such transformation has become part of the tool kit for adventurous producers and artists working with sound. The difference in the “sound ecology” being practiced here by Lami is that unlike all those other examples, in which the tape already contains recordings, Lami’s tapes begin blank. Rather than a microphone translating acoustic sound waves and registering them on tape, here Lami makes audible a chemical transformation of a different variety. Lami buried his tapes across three sites in Austria, Greece and Italy, and the results form a series of suites emphasizing accidents, flutters, and stereo-image to gesture towards environmental degradation and speculative histories of the future of our species. Occasionally there are short moments that suggest something vaguely musical – low rumbling, rhythms, short melodic fragments – but overall these results play like a kind of far-off future time capsule of damaged dreams and forgotten forms. The fact that they have been released on a label called Consumer Waste gives some credibility to such a reading. Beyond appreciating the artistic merits of the work, as a concept, a closer listen to the details of the material transformations can be engrossing and rewarding. The track-titles, such as “PPK2” and “KRR5”, likely serve as some kind of index to where a particular spool of tape was buried, but absent any kind of codex the titles remain suitably obscurantist. I recommend a good pair of headphones or a good pair of speakers, or else the detail is lost and the work is easy to misjudge. Not that this necessarily calls for high-fidelity as such, but to appreciate Bias the detail, including the stereo-image, is essential. The performances captured in the videos below add another dimension to the work. The first documents a performance in Venice during the 2015 edition of Helicotrema, a festival dedicated to creating site-specific listening situations. Utilizing three ¼” tape players, a mixer, and some subtle effects, Lami underscores another aspect of the materiality of his chosen medium. While the chemical transformation of magnetic tape is the core concern of Bias, these tapes themselves need to be made audible, and so the playback mechanism itself becomes equally important. As the long loops work their way around the room, creating crisscross patterns as they snake around their paths, the materiality of sound is exposed in yet another dimension. Replacing the clips on the microphone stands with pulleys serves as a compelling metaphor for Lami’s process. These live performances also utilize stereo-separation to communicate the physical spatialization between the various channels. Not in the sense of panning and moving sounds across the stereo-image, but in utilizing the two channels to communicate the distinction between each source. In the other video, filmed on Syros Island in Greece during Lami’s Khora residency, we see Lami manipulating a single loop, with the addition of two small shotgun microphones directed at the cascading tape, amplifying the sound of the tape’s movement itself. Edition of 150 CDs packaged in oversize 7″ sleeve, with 16 page risographed booklet featuring accompanying visual works by Giovanni Lami and a commissioned text by Francesco Bergamo.